In South Brunswick, I was one of six artist/practitioners who led half-hour, mini-workshops for conference participants rotating in groups of 15-20. The individual and collaborative drawing I introduced evoked lots of spirited discussion and laughter; more to the point, the exercises were designed to be easily shared with a client or loved one for mutual fulfillment in a caregiving context — even by those whose early art career never advanced beyond paint by numbers. 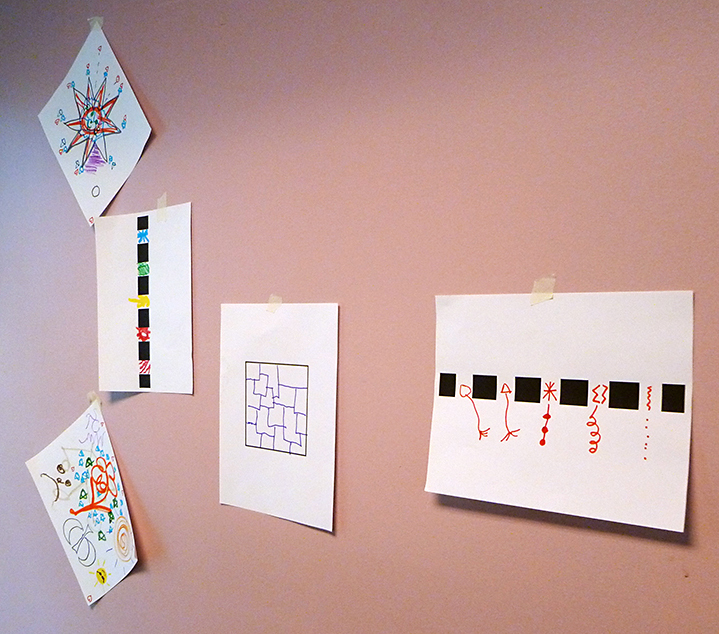 Visual exercises on display during the AIPP conference. Another reason I wanted to share the second quote was because I was paired with Carol Satz, of the Garden State Storytellers’ League, as my co-presenter for the day. Carol introduced her storytelling by asking participants to reflect on the personal meaning we might find in our given names. In response, people shared stories that were not only extremely moving but also remarkable for the rich and diverse cultural exchange that accompanied them. The narrative Carol told was based on Ernest and Elston, Laura T. Barnes’ book about a rooster who learns to value his own distinctive voice. Even though it was written for children and repeated three times that morning, it never failed to touch me. Once again, I was struck by the power of story — as opposed to advice or fact-based information — to address deeper human needs and desires, and to help bring about healthy change. In July, I learned that the two of us received the highest marks in evaluation surveys following the conference.